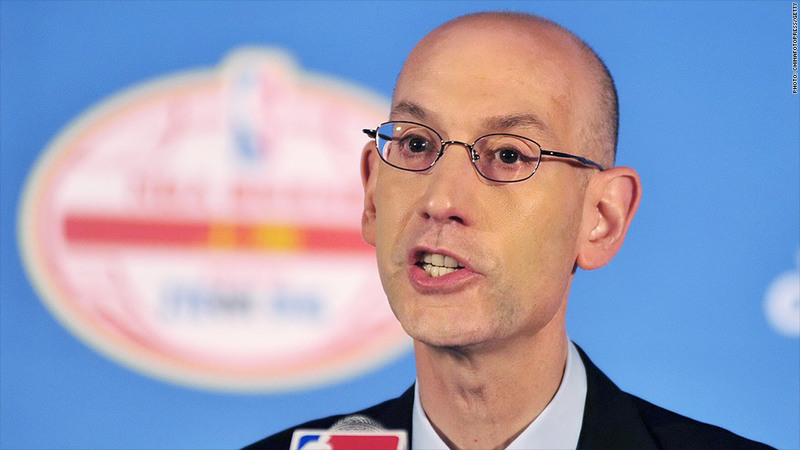 NBA Commissioner Adam Silver became the first major sports executive to come out in favor of legalized sports gambling Friday. Don't bet on him being the last. Silver was acknowledging what has been obvious in the world of sports for decades: people like to gamble on their favorite games, and will find ways to do so, no matter what the law says. "Gambling has increasingly become a popular and accepted form of entertainment in the United States," Silver wrote in an Op-Ed Friday in The New York Times. "Most states offer lotteries," He wrote. "Over half of them have legal casinos." He quoted estimates that $400 billion is wagered on sports every year. In the Op-Ed, Silver called on Congress to change the law prohibiting sports gambling in most of the country since 1992. Leagues have opposed sports betting because of the possibility it could compromise their games' integrity -- a big concern ever since the thrown World Series in 1919, where Chicago players conspired with gamblers to intentionally lose the games. That's also the main reason that despite being an attractive and growing market, no major sports team is based in Las Vegas. Silver says it is important to protect the integrity of games, but argues that it would be easier, not tougher, with legalized gambling. "I believe that sports betting should be brought out of the underground and into the sunlight where it can be appropriately monitored and regulated," he said. The National Football League, Major League Baseball and the NCAA did not have a comment Friday on Silver's position. But there are already some signs of a change of heart at the NFL, the same league that once banned Vegas tourism commercials from the Super Bowl lest it be seen as endorsing gambling. On Friday, the Washington Redskins announced a marketing agreement with FanDuel, which runs daily fantasy games. And the New England Patriots already have a deal with a rival site DraftKings. Fantasy sports is a form of sports gambling which is allowed under current law. It is estimated to be a $1.4 billion a year business. The NBA announced its own partnership deal with FanDuel on Thursday that grants it an equity stake in the site. But beyond those kinds of sponsorship deals, the leagues are betting that the biggest side benefit that gambling will generate is greater interest in their sport. More interest means even better ratings for what has increasingly become the most valuable programming on television. And that means even bigger broadcast rights deals for the leagues, which is where the big money lies.